"Wait - Click the Checkbox Below to Complete Your Order..."
Yes - Please Upgrade My Order For Free! I would like FREE trial to Alkaline Diet Premium Membership plus the bonuses below. 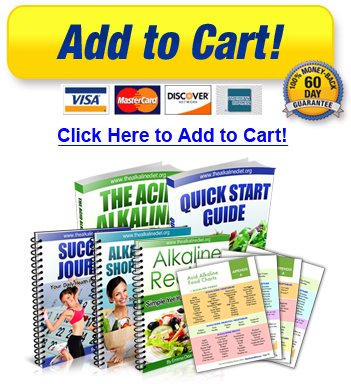 The main Alkaline Diet e-Course manual, Alkaline Diet Recipes, Acid Alkaline Food Chart, Alkaline Success Journal, Alkaline Shopping Guide. Limited to the first 1,000 customers. You also get access to the 3 Health Subliminal MP3s, the 3 health ebooks and reports. Bonuses worth $159 value. FULL trial access for FREE. Include diet planner software to track your nutrition and health level, exclusive audio interview with the pH Diet author: Suzanne Le Quesne, and Rawsome author: Brigitte Mars, and many more interviews. My initial access for 30 days is a trial of the Alkaline Membership and I have NO obligation to continue. I can cancel at any time by simple using your customer support page. If I choose to continue, I don't need to do anything, my membership will automatically continue and I will be billed a simple and low $9.97 a month.